If you aren't familiar with New York Daily News columnist Linda Stasi … well first of all, I envy you. Honestly, you might want to stop reading here and revel in your blissful ignorance. For those still with us, Stasi is sort of the left-wing Ann Coulter, if Ann Coulter had no fans to speak of. She has the same "mean girl," would-be-shock-jock shtick where every week she's paid to write spiteful, hateful things about people she doesn't like. To give one example, Stasi's take in the wake of the San Bernardino terrorist attack was to attack one of the murder victims and declare him as bad as the terrorists. The innocent man's crime? He posted conservative things on Facebook, and was "an anti-government, anti-Islam, pro-NRA, rabidly anti-Planned Parenthood kinda guy." "Now 13 innocent people are dead in unspeakable carnage," she wrote of an attack that left 14 people dead. The implication is that the man, who left behind a widow, was not an innocent and presumably deserved death. Like I said, a charming woman. But it's also worth noting that Stasi is quite unintelligent. That was on full display Tuesday in her newest column, headlined "Fox should fire reporter Kimberly Guilfoyle, who can't possibly stay neutral while dating a Trump kid." Perhaps you've already spotted the flaw in her premise. Guilfoyle is an opinion host, not a reporter, and is therefore not expected to stay neutral. She's never even been a reporter; she came to CNN and then Fox News as a prosecutor-turned-legal analyst. So right off the bat, we're not even past the headline and the entire 400-word column is wrong. "Now that Kimberly Guilfoyle is reportedly having sleepovers with Donald Trump Jr., the Fredo Corleone of the Trump boys, while she’s reporting on him," Stasi begins. Nope! Wrong! "She can’t report on the most powerful family in the country while dating one of them," she continues. Nope! Not a reporter! And so on. Does NYDN even have editors? I understand they have to give some leeway to opinion writers even if they disagree with them, but you'd figure some editor would do a Google search and be like, "this is all just wrong." If I submitted an op-ed saying it was my opinion that New York Governor George Pataki should vote for Trump's impeachment, I guess the fact-checkers would just silently fume and pull their hair out. In a particularly tone deaf moment, Stasi wrote of Guilfoyle that "when it comes to picking men, though, she’d be better off picking grapes." A common Hispanic stereotype is that they're all fruit pickers, and Guilfoyle is Puerto Rican. That line was later stealth-edited out of the piece (huh, I guess she does have editors) and Stasi insisted on social media that it was unintentional. I'm actually inclined to believe her. I also think that if a conservative made that slip-up, Stasi would memorialize his death by calling him a terrorist. But let's suppose that Guilfoyle was a reporter who was expected to maintain neutrality. The notion that she should be fired is ludicrous. There's nothing wrong with reporters having relationships with politicians or political actors, they're only expected to disclose that fact to readers and viewers if/when they report on them. If Guilfoyle should be fired, so should non-conservatives like Andrea Mitchell and Chuck Todd, Chris Matthews, CBS News president David Rhodes and ABC News president Ben Sherwood, etc. But let's suppose that Stasi is right, and even though Guilfoyle is paid for her opinion, and even though she was blindly pro-Trump before dating one of them, this is a firing-worthy offense. What then? Well, Stasi is an opinion writer. What's more, she's married to a longtime Democratic advisor who is a personal friend of, and an attorney for, New York City Mayor Bill de Blasio. De Blasio even officiated the wedding. The conclusion is clear. Fire Linda Stasi. 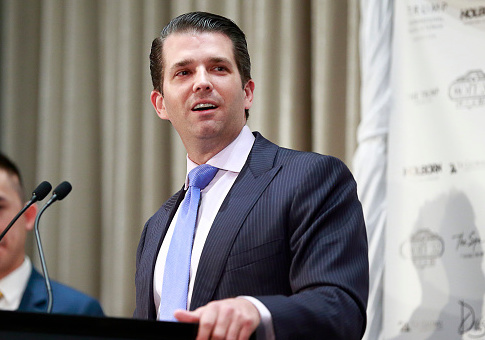 This entry was posted in Politics and tagged Donald Trump Jr., New York Daily News. Bookmark the permalink.